Sensational Old Canna Flamingo raised in 1895 by Dingee and Conard. “FLAMINGO (fla-min’go). A tropical bird of bright red color.”- Webster. 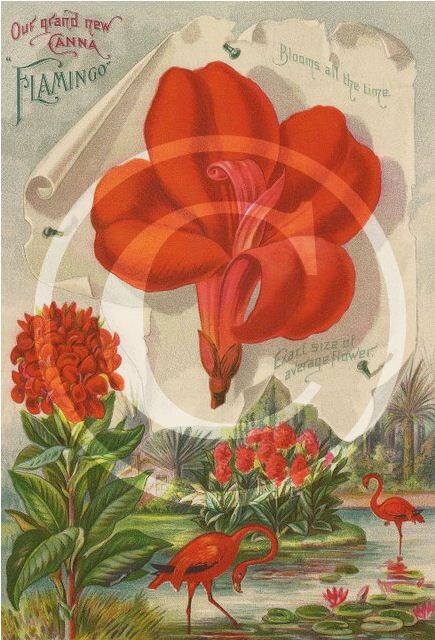 Canna Flamingo Originated and First Offered in 1895 by The Dingee & Conrad Co.
From The Dingee Conard Co of West Grove, Pa, Guide for 1896. This Peerless Pedigree Canna Flamingo was introduced by us last year, and is justly regarded as one of the horticultural triumphs of the century. It is not a chance seedling, but the result of ten years thought and painstaking work in skillful, scientific hybridization. It is impossible to conceive of any flower more striking than “Flamingo.” No canna will compare with it in the exquisite finish to flower, the glorious richness and depth of colour, ease of culture, and earliness, profusion and continuity of bloom. It is a true ever blooming canna. Whether grown indoors or planted in the open ground, it is constantly surmounted by a glowing crown of perfect blooms, whose sparkling brilliancy is as bright as the plumage of the Flamingo bird, after which it is appropriately named. Imagine a plant crowned with three to six of these splendid spikes......thus presenting an array of gorgeous colour, relieved by a background of luxuriant deep green , tropical like foliage and it will be at once considered we have a plant that for effective decorative value, either for single specimens or massing, is not equalled by any plant now known. It rarely grows more than three feet in height, and commences to bloom when but six to eight inches from the ground. Canna Flamingo Prints for sale $6 each, orders can be emailed through to me here. Worldwide Postage and Shipping $6 for 1 or 10 prints. The individual flowers are large, more than four inches in diameter, heavy in texture, and are of the most refined re-flexed form so much sought after, has the true gladiolus form which is found in no other canna. They cluster around the stem in an even manner, giving the trusses the grace and finish of a hyacinth spike. The immense trusses of bloom are born aloft in a firm, yet most graceful manner. The size of the truss is enormous, usually a foot in height and seven to eight inches diameter. It blooms continually throughout the growing season, both indoors and in open ground. Two or more side spikes are generally provided which replace in succession the main truss as soon as its bloom has faded. Of the colour it need only be said that it is an intense glowing crimson without a spot or blemish of any kind. Its brilliant beauty, which means high decorative value, is bound to make it almost indispensable for bedding and general purposes. We invite a careful comparison with any canna of its colour which will effectually demonstrate its superiority. Canna Flamingo will not lose its lustre under the test of critical comparison, but will stand out as the most magnificent all-round canna now in cultivation. Price last year $1.50 each. A large stock this season enables us to offer it at a popular price. We can truthfully say that the price of canna "FLAMINGO", invested in other plants, will not you as many flowers, as much display, nor more satisfaction than it. Be sure to include it if your order by all means. Price, strong plants, not dry roots, ready for blooming, 40 c. Each; 3 for $1; 10 for $3, post paid by Mail. Dingee Conard Co, 1896. More Cannas.......View Other Pages of Interest....Here Copyright© 2009-2018 Cannas Australia.